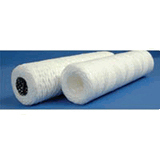 Big Brand industrial carbon filtration cartridges are a one-step carbon and filtration treatment. These cartridges eliminate the problems associated with loose carbon treatment and the need for a separate filtration system. The standard cartridges measure 2 1/2" to 2 3/4" OD with length of 30". These cartridges are designed to be used in either single or multi-tubed vessels. Big Brand carbon cartridges are available is 4 different styles: Style GC is an outer wound cartridge which utilizes a special high grade activated granular carbon with a very low sulfur content. Style CP is also an outer wound cartridge which features layers of paper impregnated with activated powdered carbon. 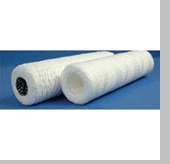 Style C is a porous polyethylene shell containing high grade activated granular carbon and Style M features an outer layer of polyolefin webbing with an impregnated carbon powder interior.